Often the first sign of the invading Martian Menace is the eerie glow of an approaching saucer—just before a paralyzing beam emerges from its underside to kidnap a hapless victim or to deliver a power pod to facilitate the invasion. 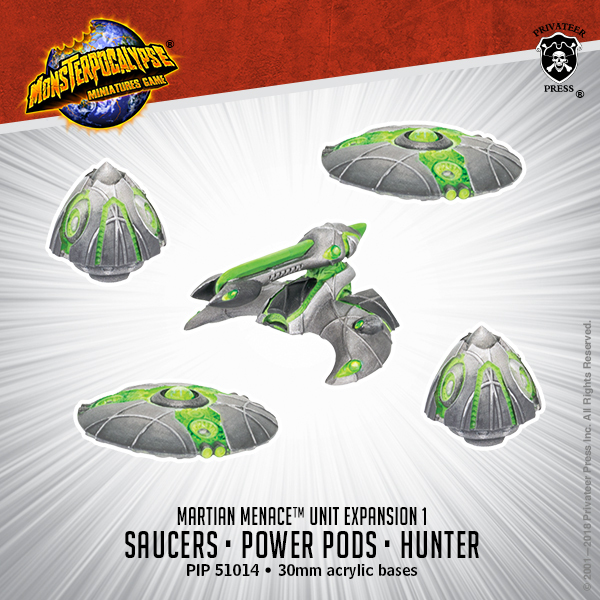 Martian power pods are an ominous sight, each a simple but effective device that siphons energy from human cities at a prodigious rate to feed the greater host vessels. The silent Hunter is an effective aerial killer, leveraging advanced Martian technology to attack on the approach from a great distance well before the enemy knows it is there.